Algae have the potential to become a valuable biofuel source. Advantages of using algae instead of terrestrial plants include extremely rapid growth rates and the fact that they don’t have to compete for land and water needed to grow food. It’s going to take time and money to commercialize the technology and build the infrastructure needed to make algal biofuels competitive with fossil fuels. Wars in the Middle East. Concerns about the sources of imported oil. Increasing demand for the world’s petroleum resources. Greenhouse gas emissions. Unstable energy prices. It’s easy to see why alternatives to traditional fossil fuels have become a hot topic. The idea that it may be possible to “grow” our way out of a future energy crisis with renewable, recyclable, plant-based fuels is an attractive one. You’ve probably already heard about ethanol produced from corn and sugar cane, or biodiesel from recycled cooking oil. But fuels from pond scum? Pond scum—more correctly, algae—may prove to be a major source of a whole range of fuels. Algae can be grown on land that is unsuitable for agriculture, with water that’s otherwise unusable—wastewater, brackish water, or salt water—using underutilized nutrients from sewage and agricultural runoff…and producing biodiesel, gasoline, ethanol, methane, and other biofuels. Although carbon dioxide is released when these fuels are combusted, algal biofuels have the potential to be carbon neutral since carbon dioxide is removed from the atmosphere by the growing algae. It sounds too good to be true—and in truth, making algae-based fuel a reality remains a major challenge. Which is not to say it’s impossible; just that it’s going to take significant effort. But given the volatility of the energy market and the concerns about using fossil fuels, it seems only prudent to explore the possibilities of such renewable biofuels. Work is already underway; much research is ongoing, especially in the U.S., to make algae-based fuels a reality. This fact sheet provides an overview of algal biofuels: what they are, various processes for producing them, and how they’ll fit into the country’s overall energy scheme. Let’s begin with the basics: algae. Actually, that should properly be phrased “What are algae?” since “algae” is the plural form of “alga.” And there’s far more to them than just pond scum. Algae are ancient organisms with an enormous number of species; unlike plants, they don’t possess distinct organs such as leaves or roots. They produce the essentials of life, such as carbohydrates, fats, and proteins, using energy from light (photosynthesis) or chemical reactions (chemosynthesis). Hugely diverse in form, they range in size and complexity from microscopic single-celled species (microalgae) to multi-cellular seaweeds such as the giant kelps, hundreds of feet in length (macroalgae) (Figure 1). Many microscopic species do not simply drift through the water but are actually mobile, moving about like amoebas or with the aid of whip-like tails called flagella. 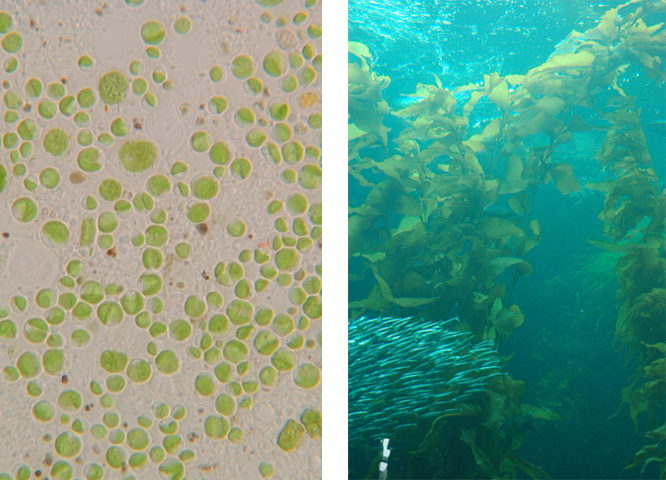 Varieties of algae may be found living in symbiotic relationships with plants or animals, protected from predators by the host while providing it with oxygen and nutrients; some in relationships so intimate it’s thought the presence of the algal species triggers latent genes in the host that influence its very development. Their life cycles vary tremendously, from simple cell division to complicated, multi-generational cycles that alternate between sexual reproduction (eggs and sperm are released by the plant) and asexual reproduction (spores). Algae thrive literally everywhere on Earth: in forests and deserts, in fresh water, in salt water, in snow and ice, in hot springs and in oceanic thermal vents—in stifling heat, freezing cold, intense sunlight, and utter darkness. Food: Algae are part of “coastal cuisines” around the world, where edible seaweeds have been consumed for centuries. Any fan of sushi consumes algae in the form of nori, a species of the genus Porphyra, used as a wrapping around the rice and other ingredients. It’s not only eaten in Japan; various species of Porphyra are eaten in Korea (where it is called gim), and in Wales (where it is called laver). Other types of algae are consumed in countries as widespread as Chile, Ireland, Scotland, Greenland, Iceland, New Zealand, and along both the Pacific and Atlantic seaboards of Canada and the United States. Seaweeds are very nutritious; depending on the species they can contain high amounts of proteins and carbohydrates; can be rich in vitamins, essential amino acids, and antioxidants; and contain significant amounts of iodine, potassium, iron, magnesium, and calcium. In fact, some algae are cultivated commercially as nutritional supplements, such as Spirulina and Chlorella. Algal products are widely used in the food industry. Agar, a gelatinous substance prepared from several species of algae, is used both directly as a food and as a thickener in a variety of products; it’s also used as a culture medium in microbiology. Carrageenan, a thickener prepared from the seaweed known as Irish moss, is used as an emulsifier in foods and cosmetic products. Animal feeds: Global demand for corn and soybeans is rapidly increasing due to their use as livestock feed; however, this competes directly with the human food supply. High-protein algal feeds could replace a significant portion of that feed. Because algae can be grown using land and water unsuitable for terrestrial crop production, this would free up water and acreage currently used to produce animal feed. Algae are also widely used in aquaculture as a food source for crustaceans and fish. Fertilizer: Algae have been used as a fertilizer and soil conditioner for centuries; they contain the usual nutrients—nitrogen, phosphorus and potassium—that are found in typical mineral fertilizers, as well as a broad range of trace elements. And, on top of that, they are renewable, unlike commercial fertilizers that are produced from fossil fuels. Pollution control: Algae can be used to recover nutrients from fertilizer run-off or manure effluent from agricultural operations. The resulting water may be clean enough for release into rivers and streams, and the enriched algae can be harvested and used as organic fertilizer. Algae can also be used to treat wastewaters from human and industrial operations. A biofuel is any fuel derived from a renewable biological source, as opposed to a fossil-based source (oil, coal, natural gas). Those biological sources can include a whole range of materials that—currently—are considered disposal problems: used vegetable oil, food waste, sewage sludge, wood waste, and livestock manure. Sources can also include crops produced for fuel production, such as corn and sugarcane (processed for ethanol), and soybean, peanut, sunflower and other vegetable-based oils (processed for biodiesel). Biofuels have advantages over fossil fuels: because they’re renewable, they reduce dependence on non-renewable fossil fuels, and because they are produced domestically, they reduce dependence on foreign sources of oil, which helps increase energy security. Domestic fuel production also supports local jobs and tax revenues, which are good for the economy. The U.S. Navy is especially interested in the energy security aspect of biofuels and has been testing aviation and marine biofuels for several years. Biofuels burn more cleanly, reducing greenhouse gas emissions, particulates and other pollutants. Biofuels can be carbon neutral, as mentioned previously, and once the entire biofuel production chain, from growth to processing to final use, is taken into account, some biofuels are projected to be far less polluting than fossil fuels. What Do Algae Have To Do With Fuel? At first glance, it may not be obvious where an organism that grows in ponds or oceans might fit into the fuel production chain. However, substances needed to produce biofuels are commonly present in algae: lipids which can be processed, and carbohydrates which can be fermented, into fuels such as ethanol, gasoline, diesel or biodiesel. Surprisingly, it’s generally the single-celled species—microalgae—that are cultivated as biomass for fuel production rather than the macroalgae (seaweeds). Fast growth rates: algae species grow far more rapidly—up to 30 times faster—than terrestrial plants, and produce far more biomass per area. Not only does this mean more frequent and larger harvests of biomass, it also means that if algae growth is affected by contamination or poor weather, a pond or containment vessel can be readily “re-seeded” in a few days, rather than having to wait weeks or months until the next growing season. They can also be harvested continuously, even daily, as long as growing conditions are kept at optimum levels. Efficient nutrient use: Algae use nutrients more efficiently than terrestrial plants, so there’s little chance of fertilizer run-off. In fact, eutrophic water—water with excess nutrients, such as fertilizer run-off from agricultural operations—can be used as a nutrient source for algae. The resulting cleaned-up water may be suitable for release back into the environment. Water and land use: One of the major concerns of using terrestrial plants as a biofuel source is that they use land and fresh water—limited resources—that could otherwise be used for food production. Algae species flourish in marginal waters that are unusable for agriculture. Depending on the species, they can be grown in brackish water, salt water, or wastewater from sewage treatment plants (where they will not only be producing biofuel but also performing the valuable function of removing excessive nutrients). And since they don’t grow in soil, they don’t take up valuable arable land; production facilities can be located on lands unsuitable for agriculture or on water bodies not suited for human use. More carbon neutral than fossil fuels: While growing, algae consume carbon dioxide, helping mitigate greenhouse gas production. In fact, it would be economically attractive to “farm” algae in the vicinity of industrial plants, using exhaust emissions as a source of carbon dioxide; there are projects underway to determine if this is practical. Higher oil production: Because of their faster growth rates, algae yield more fuel per acre than terrestrial oil crops. The main biofuels produced today are biodiesel and ethanol, but algae can be a feedstock for other fuels as well, including diesel, gasoline, and aviation fuel. 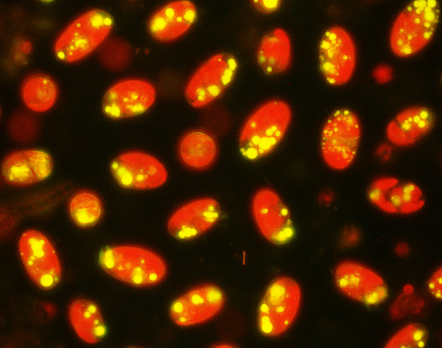 A variety of algal species produce oil (lipids); some produce so much that, under a microscope, lipid droplets can be seen within the cell (Figure 2). Renewable gasoline and diesel: Algal oil can be used as a feedstock in existing refineries, where it can be processed into gasoline and diesel that are chemically identical with petroleum-based fuels. Aviation biofuel: Aviation fuel can be produced from algal oil or algal biomass, using different processing pathways. Commercial airlines and the military are testing algal jet fuel as a way to combat volatile fuel prices and to decrease the industry’s carbon footprint. As mentioned earlier, the military is also interested in the energy security provided by a domestically-produced renewable fuel supply. Test flights of jets powered by blends of conventional jet fuel and biofuel have shown that the latter is indeed a viable option for powering airplanes. Biodiesel: Once the oil is extracted from the algae, it can be processed into biodiesel for use in standard diesel engines. It may be used alone or blended in various proportions with petroleum-based diesel. But the algal fuel story doesn’t stop there. The biomass “cake” remaining after oil has been extracted is by no means a waste product just to be tossed away—it can be further processed into other fuels. Ethanol: The algae press cake remaining after oil extraction can be fermented to produce ethanol, which can be blended with conventional gasoline, usually as an E10 blend (10% ethanol, 90% gasoline), as practiced with corn ethanol in most U.S. states. By the way, fermentation releases carbon dioxide, which can be used in growing more algae. Methane: The residual biomass after all this processing can be utilized even further. For example, it can be anaerobically digested (that is, without oxygen) to produce methane-rich biogas, an alternative to natural gas, which could be used to produce electricity for algal production or processing facilities—and burning methane produces carbon dioxide, which can be recycled back into growing algae. In fact, methane could even be the primary biofuel derived from algae. Clearly, algae are versatile fuel producers! It’ll take a lot of algae to make fuels in the quantities consumed by the U.S., so it’s no surprise that ways to grow algae at the scale required are the subject of intensive research. In theory, algae requirements are simple: water, sunlight, carbon dioxide, various nutrients. But we’re used to thinking of farming as a fairly stationary business. The plants are rooted in the soil; the soil—the growth medium—isn’t going anywhere (hopefully, barring floods and erosion); the required fertilizers, pesticides, and other chemicals are applied and sink into the soil. Algae, on the other hand, grow in suspension—floating in the water column, bathed in nutrients and carbon dioxide while exposed to sunlight. This suspension allows them to absorb what they need more efficiently than terrestrial plants, but also brings a unique set of problems. First, they have to remain suspended; the water must circulate. And second, they have to stay close enough to the surface so that sunlight can reach them; sunlight can’t penetrate water very deeply. You can probably see where this is going: a simple standing pond is not going to be the future of industrial algae farming. The twin requirements of providing circulation and light are being solved in a variety of ingenious ways, but can be classified into two basic approaches: open systems and closed systems. Open systems are just what they sound like: ponds or tanks. While natural bodies of water—ponds, lakes, and lagoons—have been used to grow algae, there are a number of problems: loss of water to evaporation, limited diffusion of carbon dioxide from the atmosphere, and problems with circulating water and nutrients. As a result, biomass production is low. Because of these drawbacks, algae are generally grown in artificial ponds that have some form of circulation control. This may consist of rotating arms in a circular pond, or inclined ponds, which use gravity and pumps for circulation. The most common design is the raceway pond (Figure 3), which cleverly maximizes the surface-to-volume ratio of the pond, and turns it into an endless stream. It consists of a series of long, shallow troughs, a paddlewheel to gently circulate the water, and baffles to guide the water flow around the bends. Nutrients, carbon dioxide, and water are piped into the pond just in front of the paddlewheel, and, because it is shallow, sunlight is available to the whole algae population. Harvesting is simple: algae-laden water is piped out just behind the paddlewheel for further processing. These structures are straightforward to build, with low operating and production costs. But both natural and artificial ponds are at the mercy of the weather: temperature fluctuations or cloudy days can seriously interfere with algal growth. They can also be contaminated by “wild” algae species that can overgrow the cultivated species, or predators that graze on algae. Finally, although they can be constructed on any type of land, they do require a sizeable area for large-scale production. To overcome these drawbacks, ponds have been closed in by simply covering them with a transparent or translucent barrier—in effect, the tank is turned into a giant greenhouse. This solves the problems of contamination by undesirable species, reduces evaporative losses, and provides some protection from temperature fluctuations, although weather can still be a problem. 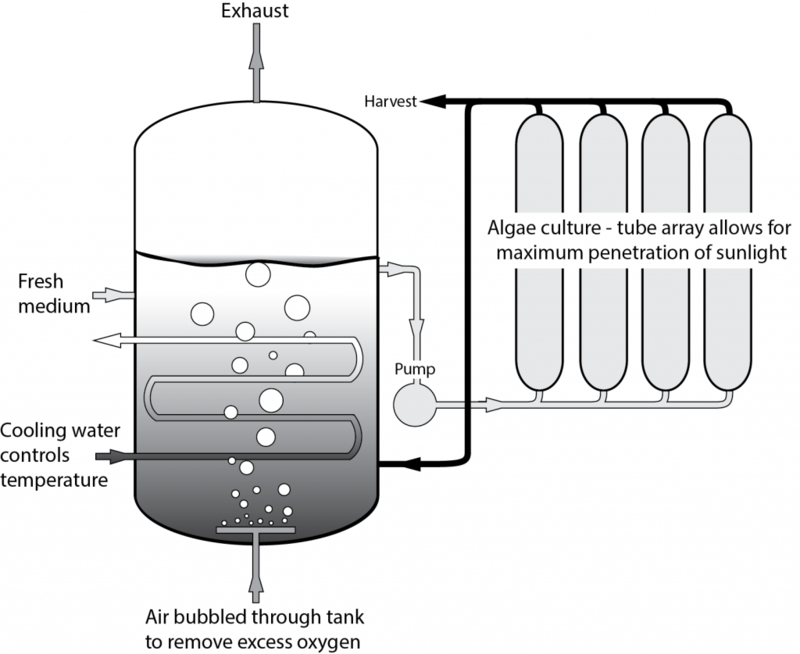 For better control of the factors affecting algal growth, a photobioreactor (PBR) can be used (Figure 4). Photobioreactors are completely closed systems, so evaporation and contamination are not a concern. The algae are grown in tubes or bags made of transparent glass or plastic; this format can greatly increase the surface-to-volume ratio and allows maximum light penetration. In one commonly-used design, the bags are arranged in vertical arrays so that as much of the surface area as possible is exposed to sunlight. If desired, artificial light can also be used to enhance growth. Pumps or natural wave action keep the water circulating to prevent the algae from settling on the surfaces and blocking sunlight. Nutrients and carbon dioxide content can be carefully controlled. All these features encourage optimum growth on the part of the algae. But closed systems come with their own set of problems. Because the system is closed, oxygen generated by the photosynthetic process—which in open systems dissipates to the atmosphere—can build up and poison the culture. So the system must include a degassing area, where air is bubbled through the water to remove the excess oxygen. Temperatures must be controlled to prevent overheating. PBRs are much more expensive to construct, operate, and maintain than raceway ponds, although the costs can be partially offset because biomass productivity is far higher. Research is ongoing to discover ways to build and operate them more economically. There’s no doubt that algal fuels will have a role in the energy economy of the future; how large a role depends on how the industry deals with a host of challenges. For instance, the whole question of potential production volumes and pricing is currently pretty fuzzy. To choose one example, estimates of algae oil yield range so widely, depending on the species and the conditions under which it is cultivated and harvested, that it’s difficult to say just how many “barrels per acre” can be produced. Until more rigorous studies are done at commercial scale—not just bench-top prototypes in a laboratory—we won’t really know what the economics of algal biofuel production will actually be. Furthermore, simply getting the oil out of the algal biomass is not the end of the economic story. Other valuable products are also present in the remaining algal biomass. Many species produce high-quality proteins, essential fatty acids, or vitamins that can supplement local dietary needs, or be used in aquaculture or animal feed products. Microalgae are currently cultivated for compounds such as astaxanthin, beta-carotene, lutein, etc. These high-value products can help subsidize the development of cheaper biofuel. Another factor to keep in mind is the time it will take to develop the necessary cultivation and harvesting techniques, processing equipment, and industrial processing pathways to get from pond to pump. The current petrochemical industry didn’t spring up overnight—it took billions of dollars to build the required industrial infrastructure and many decades of research and development to reach the point where gasoline is now produced efficiently and economically. It’s unreasonable to expect that the infant biofuel industry will be similarly viable within just a few years. Identifying and developing species of algae that will respond well to cultivation conditions/processes and produce economically important quantities of desirable carbohydrates or lipids is another aspect that must be explored. Consider the development of corn: due to human intervention over thousands of years, the species has been altered enormously from the original wild grass to today’s multitude of corn varieties. There are corn varieties suitable for every need, from tasty table versions to varieties suited for animal feed and industrial applications, including a variety intended specifically for ethanol production. And that is just from a single species: there are tens of thousands of algal species, many of them currently unknown to science. The search for suitable algal species—what one researcher terms “phycoprospecting”—is just beginning. And when suitable species are found (or developed), precautions will have to be taken so that once they are removed from their natural environment and exploited in commercial operations, they don’t accidentally become invasive pests. Fracking and the recent crash in oil prices have made it harder for algal biofuels to reach cost parity with fossil fuels and reduced interest in algae as a source for biofuels. For example, the Department of Defense, while awarding funding to three companies to construct refineries to produce “drop-in” military fuel at competitive prices, is focusing on processes involving waste fats, municipal solid waste, and waste forestry biomass. Interest in biofuels isn’t restricted to the U.S. The International Air Transport Association (IATA), a trade association of the world’s airlines, is particularly interested in alternative aviation fuels. IATA recognizes “aviation has no alternative to liquid hydrocarbon fuels in the next decades …Sustainable alternative fuels, which currently are mostly biofuels, are therefore the only renewable energy available for air transport for many years to come.”  The group has issued annual reports on the subject since 2007, and mentions that since 2011, there have been 1,600 commercial passenger flights fueled by blends of up to 50% biojet fuel produced from, among other sources, algae. The future for algae as a source of fuel remains promising—and given a chance, it may indeed live up to that promise. Algaculture – Wikipedia, the free encyclopedia. (n.d.). Retrieved June 25, 2012. Algae fuel – Wikipedia, the free encyclopedia. (n.d.). Retrieved March 18, 2015. “Algae to Recycle Metals and Biofuel from Contaminated Mine Water in Cornwall.” Waste Management World. (n.d.). Retrieved April 28, 2015. Algal Biofuels. U.S. Department of Energy, Office of Energy Efficiency and Renewable Energy. (n.d.). Retrieved May 6, 2015. Algal Biofuels: Long-Term Energy Benefits Drive U.S. Research. (2013, March). U.S. Department of Energy, Energy Efficiency and Renewable Energy. Alternative Fuels Data Center: Biodiesel Vehicle Emissions. (n.d.). Retrieved March 18, 2015. Biodiesel – Wikipedia, the free encyclopedia. (n.d.). Retrieved June 25, 2012. Bioenergy. U.S. Department of Energy, Office of Energy Efficiency and Renewable Energy. (n.d.). Retrieved May 6, 2015. “Developing biofuels from algae.” (n.d.). Cornell Chronicle. Retrieved June 25, 2012. Edmundson, S.J. and Wilkie, A.C. (2013). Landfill leachate – a water and nutrient resource for algae-based biofuels. Environmental Technology 34(13-14):1849-1857. Learning – Biofuels Basics. National Renewable Energy Laboratory (NREL). (n.d.). Retrieved June 25, 2012. National Algal Biofuels Technology Roadmap. (2010, May). U.S. Department of Energy, Energy Efficiency and Renewable Energy. Wilkie, A.C., Edmundson, S.J., and Duncan, J.G. (2011). Indigenous algae for local bioresource production: Phycoprospecting. Energy for Sustainable Development 15(4):365–371. b BioEnergy and Sustainable Technology Laboratory, Soil and Water Science Department, Institute of Food and Agricultural Sciences, University of Florida, Gainesville, FL. c Patel College of Global Sustainability, University of South Florida, Tampa, FL. First published June 2012. Updated May 2015. U.S. Department of Energy, Office of Energy Efficiency and Renewable Energy. Alternative and Advanced Vehicles: Biodiesel Emissions. Retrieved April 18, 2012. Wilkie, A.C., Edmundson, S.J., and Duncan, J. G. (2011). Indigenous algae for local bioresource production: Phycoprospecting. Energy for Sustainable Development, 15(4):365–371. US Navy, DOE, USDA award $210M for 3 biorefineries and mil-spec fuels. Biofuels Digest. (2014, September 19). Financial Opportunities: Targeted Algal Biofuels and Bioproducts (TABB). (2014, December 15). IATA – Alternative Fuels Fact Sheet. (2014, December).